Weeping blue Atlas cedar (Cedrus atlantica 'Glauca Pendula') is a weeping evergreen. This superb ornamental tree can be grown in zones 6-9. Pendant limbs drip with icy-blue needles. This slow grower prefers full sun and is drought-tolerant. 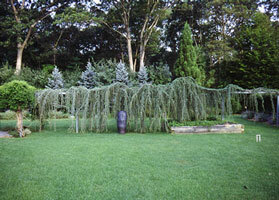 It's difficult to provide dimensions for weeping blue Atlas cedar. It really depends on what you do with it. 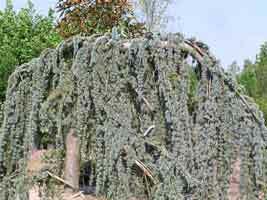 If you stake it, you can train weeping blue Atlas cedar to grow 10'-12' high, from which height it will cascade down. But if you don't stake it, the plant will look like an amorphous blob bubbling over the landscape. Weeping blue Atlas cedar will grow about 1' per year. 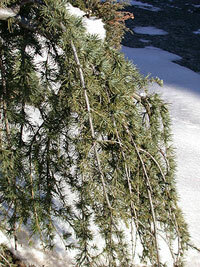 Like weeping blue Alaskan cedar, this tree's powder-blue foliage provides year-round visual interest. Size - Variable, needs to be staked and trained, other wise it can ramble in to about any imaginable form in about any direction. One I have on campus I am training to a height of about 12 feet and then will let it spill over and cascade. A growth rate of 1 to 1 1/2 feet per year could be expected. Landscape Use - Specimen, must be trained to develop a central leader to get the effect. A very worthwhile plant to acquire if you invest the time into training it. A well developed, older, Weeping Blue Atlas will be the envy of your neighbors and gardening friends everywhere. Can be trained to the height that fits the scale of your garden.the height that fits the scale of your garden.